I have wanted to go to South Africa ever since reading about Nelson Mandela’s hard work for peace and his anti-apartheid movement. The first English beginner book that I ever read was a brief biography of Mandela. I was just learning English in 2007 and my homework was to read the book in a week and share the story with my classmates. I borrowed a dictionary from my school library. After five days of reading, I got the general idea that he was famous for being a trouble maker in his childhood. He lived with different families, but never gave up. Some words I learned in the book and always have in my mind are: freedom, protest, tirelessly, peace, humanity, justice, equality, pioneer. I was amazed by this great personality who worked tirelessly to free his people from the clutches of an evil system called apartheid. He taught his people how to fight against injustice, how never to accept oppression or to lose hope. Although he was imprisoned many times, he continued his protests against inequality and racism and after a long and hard struggle he won the freedom of his countrymen and proved that all people should have equal rights. It did not matter what was the color of their skin. He was a perfect example for those who want freedom and justice in the world. I was inspired by his strength, his vision, his motivation, and his achievements and I learned that the key to success is not only working hard, but working smart. There is an old quote “I am the master of my fate, I am the captain of my soul” that is said to have inspired Nelson Mandela in prison. It had a strong effect on me. It guides me to follow my own way and gives me self-confidence. There is always an inspirational hero in everyone’s life whose perspective can change her or his life and my inspirational hero was Nelson Mandela, a great blessed man in history, who taught me self-esteem and philanthropy. Although Mandela is not with us today, his words and his humanitarian activities are in our minds. He did his duty honestly, not only for his own people, but the world. He taught us tolerance, liberality, gentility, and generosity. Today, the whole world notices his absence. 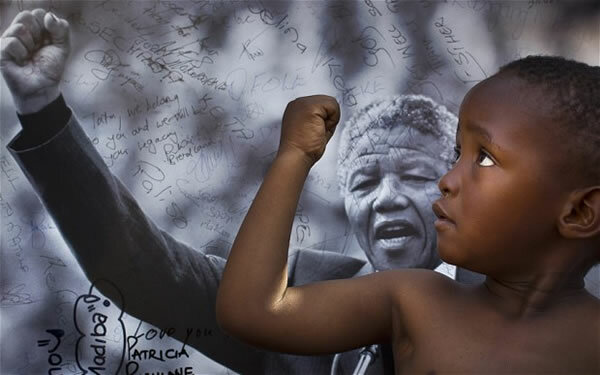 I still want to go to South Africa to his birthplace where he proved for the world that humanity exists in the world. I believe that everyone was born for a reason, but some people never go for it. Nelson Mandela did his duty and we are grateful to him. If any of us can bring a small positive change in even a very small part of the world, humanity can be born again. Kamilah is a student abroad. AP Photo. I have read many tributes to Nelson Mandela, but this is one of the most beautiful. Thank you so much for writing it. I love the words you learned from reading about this great man and he would love the fact that his life taught you these words! You are a wonderful writer! Love this piece. Kamilah your words are very strong. Everyone has an inspirational person in her/his life, and yes, Nelson Mandela was the one who inspired the world. Thank you for sharing this moving piece. Wish you all the best!